Over the next 4 weeks the IPC staff will contribute some of their most compelling cases from the call center that often start with three words, “my child ate…” We hope you enjoy this blog series, and we encourage you to share your own “My Child Ate…” stories or your poison center experience. As parents and caregivers, when it happens to our family, sometimes we laugh, sometimes we cry, but we are always concerned. Is it harmful? Did they eat too much of it? What is going to happen? Calcium Channel Blockers: These are medicines used to control high blood pressure or fast heart rates. Some of the generic names of the drugs may include verapamil, diltiazem, nifedipine and amlodipine. When ingested by a toddler, they can cause very low blood pressure and low heart rates. This can be very difficult to treat medically and occasionally leads to death. Prescription Pain Medications: These are pain medications used to treat acute and chronic pain. Many of them are narcotics and include the generic names of hydrocodone, codeine, hydromorphone, morphine and methadone. 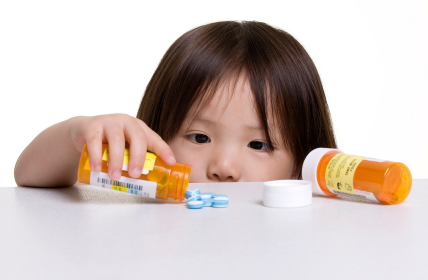 Narcotic pain medications are especially dangerous to children. Because of their small size and weight, a single pill can cause a child to become unconscious and stop breathing. Oral Diabetes Medication: The pills that lower the blood sugar of people with diabetes can cause a dangerously low blood sugar in small children. Some of the generic names include: glipizide and glyburide. The brain depends on the sugar in the blood (glucose) for energy. When the glucose level in the blood gets too low, children can become unconscious and have seizures. Anti-malarials/Anti-inflammatory medications: Chloroquine and yydroxychloroquine are used to treat malaria, but also used as an anti-inflammatory medication for people with diseases like rheumatoid arthritis and lupus. Symptoms of an overdose may range from nausea and vomiting to low blood pressure, shock, cardiac rhythm disturbances and possible death. The prescription medications we take can make us feel better, control disease processes and allow us to live longer and healthier lives. 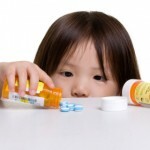 However in the hands of a curious child, these life-extending medications can be life-threatening. Please be sure to store all medications safely and securely. If you ever have a concern or question, call the Illinois Poison Center at 1-800-222-1222 for immediate, free and confidential information and treatment recommendations. Don’t guess . . . be sure. Don’t forget to join us next week for our 2nd installment of the “My child ate…” blog series. Next topic = poop! In the meantime check out one of our favorite blogs, “A Day of in the life of a Poison Center” to get a deeper look into the IPC and the types of calls we receive.